Toronto. Our city reached a population of over 86,000 in 1871, a few years before the City Directory of 1879 was published and distributed. Take a look at the Wikipedia entry shown for Toronto to see its interesting history. 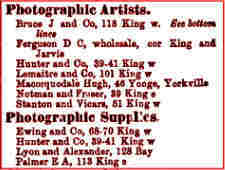 In 1879, some four suppliers of photographic gear were listed along with seven studios, including one listed as “Notman and Fraser”. Almost all were clustered around the corner of King and Yonge Streets. The city at the time had a population around the size of that in modern-day Barrie. Thanks goes to George Dunbar for spotting this bit of history in the City Directory of 1879 which was likely compiled a year earlier. City Directories are a great source for genealogists. I traced my mother’s ancestors on her father’s side from Port Hope to various homes in the Junction/Toronto West. In the 1980s all the houses still existed in the area and I was able to take a photograph of many. 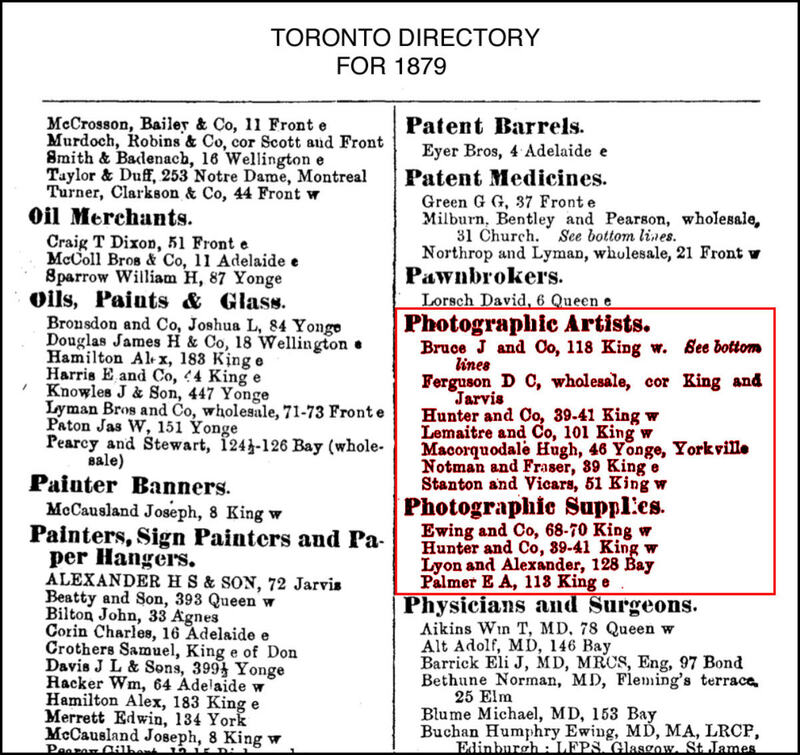 This entry was posted in miscellaneous and tagged city directory, studios, supplies, Toronto. Bookmark the permalink.